I’m in a vineyard on top of a graceful hill overlooking the Rhône River from the right bank. Right bank meaning not Châteauneuf-du-Pape. In the Southern Rhône Cru Lirac. The morning was incredibly rainy; driving to Lirac from Avignon, water poured down the sloped roads and normally-sunny Provence was saturated. Someone in our group – all guests of Rhône Valley Wines – slipped on rain-drenched stone; later a speeding truck dumped water from its roof on us. But now the sky is clear, leaving behind the most unusual artistic play of light and shade, shadow and illumination, on a fall-changing set of vineyards and cliffs. I can hear the voices of children in the hamlet down below us, church bells too. “Imagine you are in the vineyard, doing a good job, a very good job sometimes, yet nobody comes,” laments Rodolphe de Pins, winemaker at Château de Montfaucon and Co-President of Lirac AOP. I try to picture him, clad in his barn jacket and jeans, working all day in the wind and sun, then coming home to an empty shop, waiting for the little ring-a-ding announcing that a customer has come calling. It’s heartbreaking. France’s Rhône River runs north to south, beginning in the Swiss Alps and eventually finding its way to the Mediterranean Sea. 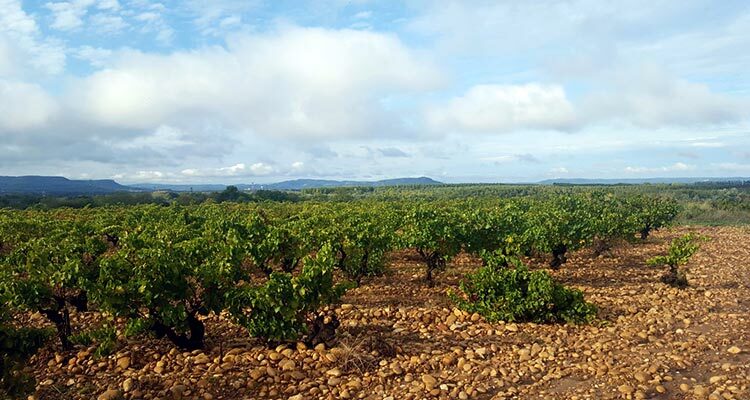 Populating its banks are world-renowned vineyards, divided into Northern and Southern designations, the latter of which includes the Lirac Cru. In a valley where wines are classified by region – not variety – possessing this Cru designation is a key distinction, as there are only 13. Though Lirac was officially recognized as such in the 1940s, the area has been known for quality vineyards since the middle ages, famous for fresh, aromatic and structured wines. Lirac is the across-the-river neighbor to Châteauneuf-du-Pape, which is like living next to royalty – a heritage that can’t be duplicated. Generation after generation of comparison gets frustrating. But what if the time has come – a friendly revolution so to speak — when duplication and comparison no longer count? This is what de Pins feels is happening in Lirac, a fresh undertaking of the familiar processes of wine growing, making and selling. De Pins took over his estate in 1995, after completing his studies at UC Davis. He lives in the on-property castle with a history dating back to the 11th century, built when the river separated the French Kingdom and the Holy Roman German Empire. The cellar, which is still used to age wine, dates back to 1520. In the late 1800’s, the castle was restored by Baron Louis Pertuis de Montfaucon, an amateur winemaker who today has a unique cuvèe named in his honor – inspired by de Pins’ discovery of labels the baron himself created. Under de Pins’ care, the winery has transformed from a small co-operative-driven operation of 17 hectares to an expansive estate of around 60. The kids I hear down below are the children of his community, a community he employs annually to work the hand harvest (and only hand harvest) of his grapes. Though he resides in a castle, de Pins doesn’t hold a position of aristocracy. Living in the château does, however, position him as curator for local heritage. And he is elevated in Lirac, with his position as Co-President of the Cru. I ask around the valley to learn what this means. Is it an honor, like a fancy thing? No, it turns out, it’s not fancy, but it is a lot of work. Like, paperwork… and worse (to me), politics. It takes a certain type of person to convince others that they came up with his good ideas. But I can see how de Pins would excel at this; I imagine him in his vineyard, in meetings, in his castle… doing a good job, fighting the good fight. Then, ring-a-ding, somebody comes; today it’s me. I’m here in Lirac, stunned by the precious, delicate nature of a snail on a wet and twisted Clairette vine. I’m here in Lirac, breathless over the blushed color of a single vine in a set of fading green ones. A vine doing its own thing. Some of these now-elderly vines, it turns out, were grown in the field as a nursery. In the old days, military men went away to battle and brought back cuttings from elsewhere. This was before AOP, so yes, some of them don’t fit in. But these vines have their own understanding of their place in the vineyard. They compose a sort of family gathering. “There is intelligence of the vineyard,” comments de Pins. “Maturation of various grapes in the field gets closer.” By this he means the grapes, after growing together for decades, tend to mature at a similar pace. Which, he explains, enables harvest of field blends. In many ways, it’s the same function that gets all the siblings out the door to school… eventually a common ground is settled on, and the group becomes greater than the sum of its parts. In his cellars, de Pins offers wine surrounded by stacks of resting barrels in the 1520 cellar. 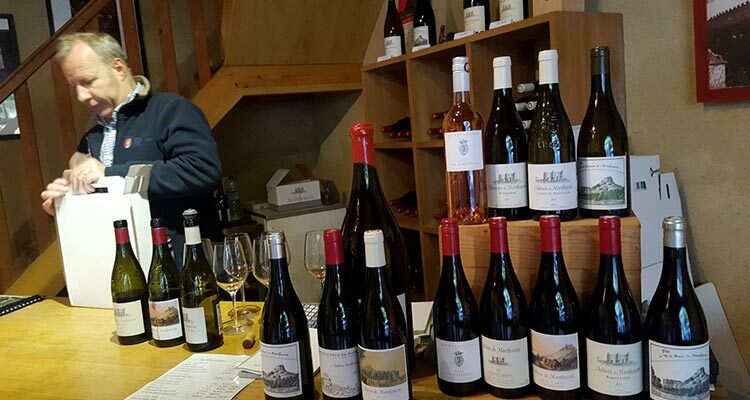 We taste his 2014 Lirac Red, the label a reincarnation of a painting by the “friend of an ancestor”, Victor Hugo, then a selection of vintages of Baron Louis, named after the castle’s restorer. All of them are fresh and substantial. De Pins’ excitement to share is obvious, and he’s even generous enough to open a bottle of Baron Louis from 2005, the year my son was born. 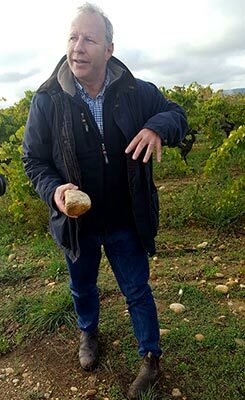 Lirac and its neighbor Châteauneuf-du-Pape do share resources; many winemakers produce from both areas, and the alluvial terrace soil, recognized by brightly colored quartzite pebbles (galets), exists in both locations. 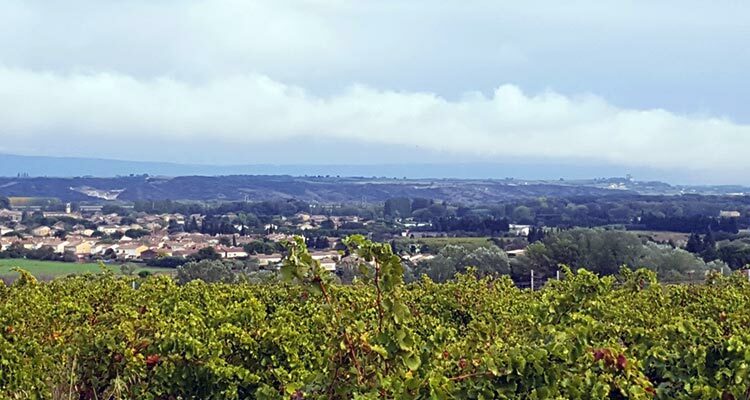 The former region is certainly capable of producing wines that meet the stature of the best Châteauneuf-du-Pape – full of aromatics, elegance and freshness – but they haven’t always capitalized on potential. Today, they look to leave behind a past that relied heavily on mass produced rosé and co-operatives, instead focusing on finer winemaking alongside their more renowned valley cousins. The Pope did, of course, once live across the Rhone. And folks from Châteauneuf-du-Pape often jest that, “no good weather and no good men” come from the right bank. Apparently it’s a classic joke around here, an insult tossed over the river, but it seems to have lost some relevance. 2016 was a top year for Lirac, preceded by a strong year in 2015. Well over half of production is now being exported abroad, conveying a sense of global demand for these wines. Today’s Lirac reds are redolent with garrigue and freshness and exhibit the potential to age elegantly, at a price well below the more famous Crus. The region’s whites are floral and fruity, with flavors that evolve to wild herbs and honey. 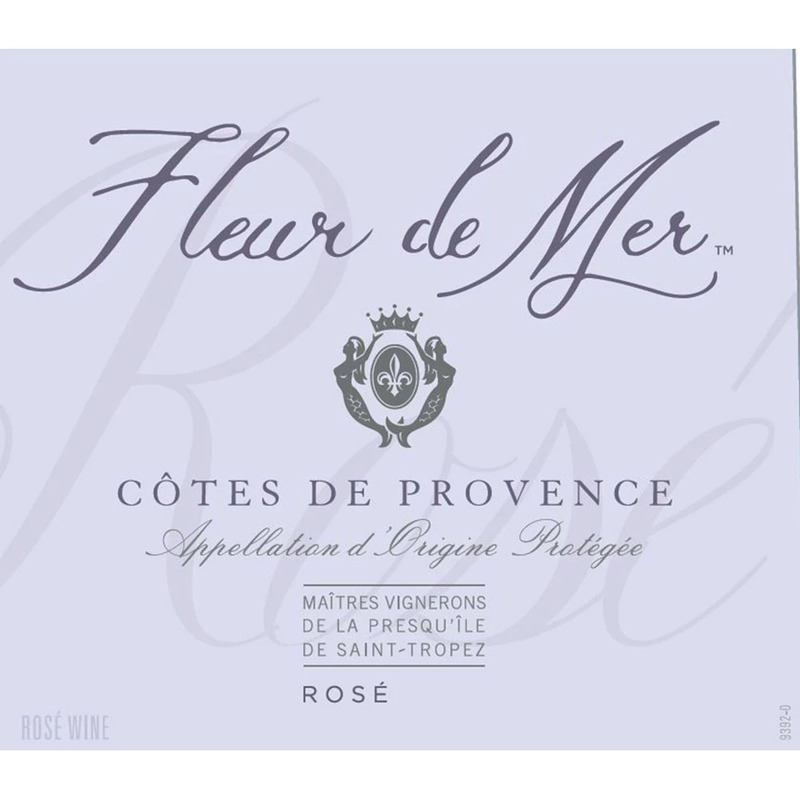 Bright yet subtle, they satisfy a taste for white wines in a region acclaimed for red and rosé. And speaking of rosé, it can’t be made in Châteauneuf-du-Pape, but Lirac produces a small amount that’s balanced, smooth and aromatic, often more intense in color that the traditional Provençal versions. When we emerge from Château de Montfaucon’s cellars, de Pins helps us into the van and kindly pushes the awkward and heavy door shut. As we drive away, he actually waves, two generous open palms out, and smiles. The sky is now blue. That thing they say about the weather? Sounds like poppycock. And the men? Well, meet Rodolphe de Pins. And nobody ever said there wasn’t good wine in Lirac. Good weather, good men and good wine. Has a bit of a ring-a-ding to it. A smooth blend with medium body with spice, dark fruit and black cherry. This bottle presents the affordable luxury of well-done Southern Rhône wine. Balanced acidity on a full body of ripe berry fruit and smooth tannins, from the Alain Jaume family of wines. Half Grenache, the other half equal parts Syrah and Mourvèdre, this wine is rich with black fruit and ripeness. Drink now or keep for several years. Bernard Duseigneur produces this certified biodynamic, unfiltered and layered wine. Peppery red fruits, gaining complexity with age. Jill Barth is a freelance wine writer and journalist based in the US. She blogs at L’occasion. Her primary (but not limited) focus is on southern French wines. Jill is on Instagram and twitter as @jillbarth.